This is both restaurant review and utter celebration. Honestly, several days later and I still feel like crying with joy! Jonathan, Sanam and Jon and I went into the lovely bohemian town of Paia in Maui for the day. We were there to explore and meet a new friend and meet up for lunch. Dania who does marketing for the Maui Edible Magazine recommended that we meet at the Flatbread Company down the way because of its locally sourced food and organic goods. I sighed inwardly, because although I knew that I could have a yummy salad there, the idea of eating a salad while everyone around me ate an amazing pizza made me a bit sad inside. Off we went and it was a lovely place with an amazing aroma of bread in the air, which I promptly inhaled with gusto. I figure if I can’t have the bread internally, I can at least savor the smell right? Oh my lovely readers… You have no idea what happened to me when I looked through the menu, and on the bottom of the first page I read that gluten free flatbread was available. I even surprised myself with the wave of joy that rolled through me. Do any of you remember Snoopy? There are scenes when he is overjoyed and he dives up into the air, nose first, while spinny in utter happiness? This is what I felt like! PIZZA! For. me! I get misty just thinking about it. Rather then having a tomato sauce, it had garlic olive oil and seasoning. The cheesy goodness on top had me singing, moaning and closing my eyes on a frequent basis. I ate the whole 12 inch pizza myself with the exception of the slice I gave Jon to taste. The food was great, the service was impeccable and the pizza was delicious. I swear, its still one of the hardest things to deal with, having to deny myself pizza on this gluten free/celiac journey. But Flatbread Company? You can bet your little bootie I’m going to be going there often while living here in Maui. If you ever find yourself on Maui go visit. You might see me there. What a great post…I am so pleased for you that you found this pizza:) It looks great! That pizza looks amazing! Thanks for sharing a great review and peek into the restaurant. It sounds awesome. We found the Flatbread Company in January when we vacationed on Maui. We spent three wonderful nights at the Paia Inn, just next door. I'm itching to go back! Ahhh, how I miss Hawaii! Wonderful post. 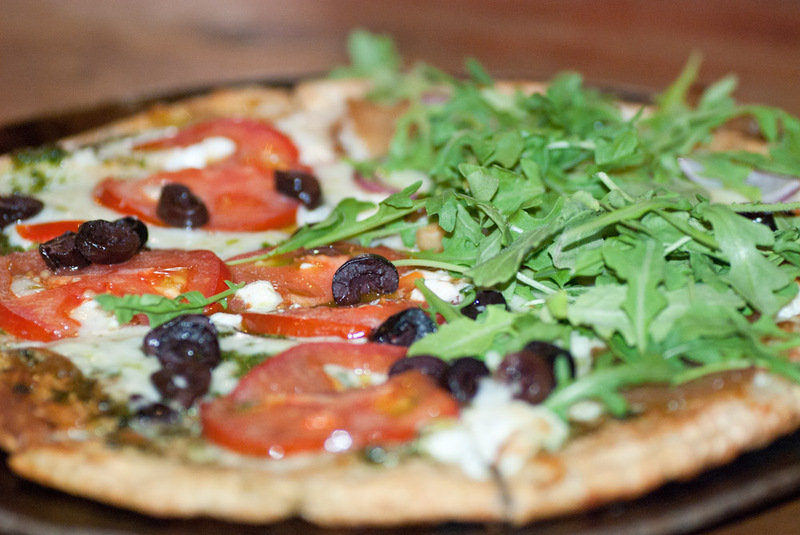 The flat bread looks fresh and amazing! We just passed throug. Paia town, stopping briefly at Anthony’s Coffee House across the street from the Flatbread Company…I have never been there. We used to love the original Jaque’s which was in their location. Now that I’ve read your post, I will definitely be visiting soon.Looks and sounds terrific. Marilyn, Definitely visit! The food is predominantly locally sourced and the pizzas are amazing! This should be on the food network Best Thing I ever ate…….Gluten FREE….Great experience….Great drinks…. I agree! I'm heading back to Maui in just over a month and I've got my trip to Flatbread all planned out already! I too have a review of their restaurant on my website, http://www.glutenfreemaui.com Unfortunately I have found myself quite ill about half of the time after eating pizza there. I know they're doing their very best to prevent cross contamination, but it's not always perfect of course in a place with flour in the air. The pizza is delicious, and I do wish I could eat it again. Its so interesting you share this. I've experienced that twice in the past, and just recently went back. While ordering a Gluten free pizza, the waitress asked me if it was for allergy reasons, or just something I wanted to try. I had never been asked this before, because quite frankly, I just assumed that if I ordered Gluten Free, THEY would assume it WAS for allergy reasons. Well! Not so. If you order it for allergy/intolerance/health issues, they make it in such a way where there isn't much chance of cross contamination! If you're willing to risk it… I would go back and try again. I'm actually thinking of doing another write up on this, discussing this. You're right about the ways in which they prepare it differently for people with an "allergy" (which Celiac disease is not) or for people for whom it is just a dietary choice. I always explain that it is an "allergy" and that it needs to be separated. Despite their actions to prevent cross contamination I find myself ill. The longer someone is gluten free the more sensitive they really can be come. I suppose that is what is happening for me.